5 x 7; originally bound in a light tan cover that always contained a picture of Pegasus. New York, New York: AMS Reprint. Covers 1912 – 1928. Chicago, Modern Poetry Association, (1912 – ). Reorganized as the Poetry Foundation, 2002. Harriet Monroe founded Poetry: A Magazine of Verse in 1912 because she was dissatisfied with the opportunities available for American poets. Popular magazines gave poetry a minor role, as they desired more “serious” fiction and essays; Monroe sought to remedy this problem by creating a publication exclusively for poets. She hoped to create a magazine in which poems of extensive length and difficulty could be published, as well as provide forum for amateurs trying to put their work in circulation. An open door policy was established in 1912, keeping the magazine open to all poetic schools. With the help of patron and friend HC Taylor, Monroe solicited one hundred businessmen and women to pledge fifty dollars a year for five years to ensure Poetry‘s economic stability during its infancy. Monroe sent a “poets circular” in search of contributors to fifty American and British poets, almost all of whom replied with interest to her inquiry. Among her earliest and most notable supporters were Ezra Pound, who served as the magazine’s foreign editor, and the indispensable Alice Corbin Henderson, Monroe’s associate editor. In its first years Poetry boasted an impressive list of contributors which included Wallace Stevens, Lindsay Vachel, and W. B. Yeats, as well as several pioneers in the Imagiste movement, such as Pound, H. D., and Amy Lowell. One of the more conservative little magazines in print, Poetry gained the respect of a wide audience. It published the first poems of fledgling poets like Marianne Moore as well as the work of more established poets like T. S. Eliot and Robert Frost. As it increased in both prestige and age, Poetry became the definitive magazine of verse, publishing both minor and canonized twentieth century poets to the present day. “In the huge democracy of our age no interest is too slight to have an organ. Every sport, every little industry requires its own corner, its own voice, that it may find its friends, greet them, welcome them. The arts especially have need of each an entrenched place, a voice of power, if they are to do their work and be heard. For as the world grows greater day by day, as every member of it, through something he buys or knows or loves, reaches out to the ends of the earth, things precious to the race, things rare and delicate, may be overpowered, lost in the criss-cross of modern currents, the confusion of modern immensities. Painting, sculpture, music are housed in palaces in the great cities of the world; and every week or two a new periodical is born to speak for one or the other of them, and tenderly nursed at some guardian’s expense. Architecture, responding to commercial and social demands, is whipped into shape by the rough and tumble of life and fostered, willy-nilly, by men’s material needs. Poetry alone, of all the fine arts, has been left to shift for herself in a world unaware of its immediate and desperate need of her, a world whose great deeds, whose triumphs over matter, over the wilderness, over racial enmities and distances, require her ever-living voice to give them glory and glamour. Poetry has been left to herself and blamed for inefficiency, a process as unreasonable as blaming the desert for barrenness. This art, like every other, is not a miracle of direct creation, but a reciprocal relation between the artist and his public. The people must do their part if the poet is to tell their story to the future; they must cultivate and irrigate the soil if the desert is to blossom as the rose. The present venture is a modest effort to give to poetry her own place, her own voice. The popular magazines can afford her but scant courtesy–a Cinderella corner in the ashes–because they seek a large public which is not hers, a public which buys them not for their verse but for their stories, pictures, journalism, rarely for their literature, even in prose. Most magazine editors say that there is no public for poetry in America; one of them wrote to a young poet that the verse his monthly accepted “must appeal to the barber’s wife of the Middle West,” and others prove their distrust by printing less verse from year to year, and that rarely beyond page-end length and importance. We believe that there is a public for poetry, that it will grow, and that as it becomes more numerous and appreciative the work produced in this art will grow in power, in beauty, in significance. In this belief we have been encouraged by the generous enthusiasm of many subscribers to our fund, by the sympathy of other lovers of the art, and by the quick response of many prominent poets, both American and English, who have sent or promised contributions. 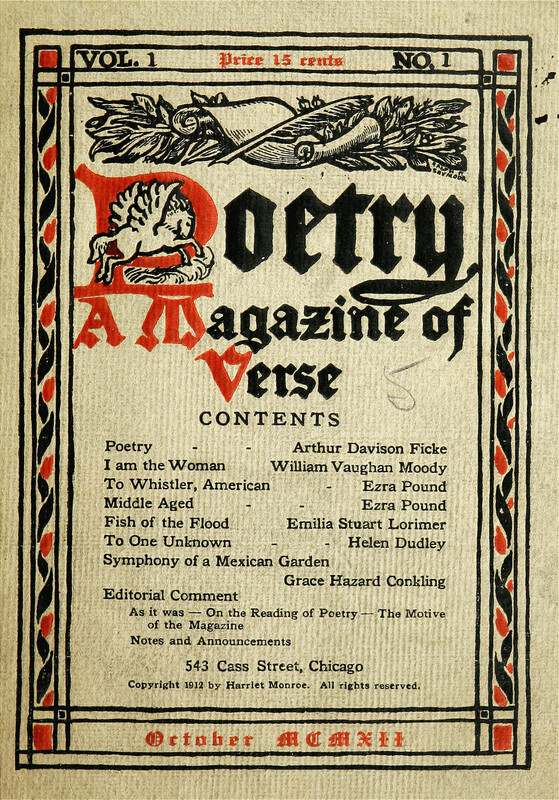 Poetry: A Magazine of Verse, 1:1 (1912): 26-28. Harriet Monroe, a Chicago native, spent part of her early life studying in China. Upon her return to the United States she was highly dissatisfied with the poetic scene. Her poetry submissions were rejected from magazines such as Atlantic Monthly, a publication that, like many, held the view that poetry was a mere filler for the more important essays and articles. In 1912 at the age of fifty-one, she created a new forum exclusively for poets: Poetry. During her lifetime Monroe edited several volumes of poetry, wrote a book of collected essays, Poets and their Art, co-edited an anthology called The New Poetry with her colleague and friend Alice Corbin Henderson, and composed an autobiography, A Poet’s Life. Drawing upon the experiences gained from moving frequently in her childhood, Alice Corbin Henderson published her first book of poetry when she was a junior in high school. When she moved to Chicago in 1903, she met art instructor William Penhallow Henderson, whom she married and who illustrated her first children’s work, Adam’s Dream and Two Other Miracle Plays for Children (1909). In 1912 she cofounded Poetry with Harriet Monroe. Henderson often receives credit for discovering such poets as Ezra Pound, Robert Frost, and Carl Sandburg (Anderson). She and Monroe edited an anthology, The New Poetry (1917), but Henderson fell ill and sought a warmer region for her health. She spent the final years of her life in Santa Fe, embracing the regional voice; the Henderson’s New Mexican home, Camino del Monte Sol, became a popular gathering ground for authors like Witter Bynner and John Gould Fletcher to share their works. Anderson, H. Allen. “Henderson, Alice Corbin.” American National Biography Online. 2000. American Council of Learned Societies. 7 July 2009. Arzaga, Lorelei. The Poetics of Harriet Monroe. MA thesis. California State University, Long Beach, 1992. Cahill, Daniel J. Harriet Monroe. New York: Twayne Publishers, 1973. Goldbarth, Albert. “The Lake.” Georgia Review (1996): 360-379. Henderson, Alice Corbin. “Harriet Monroe and Poetry’s Early Years.” Illinois Writers Review 7.2 (1998): 16-21. Images. “Poetry.” The Modernist Journals Project. 2007. Brown University. 17 July 2009. Massa, Ann. Form Follows Function: The Construction of Harriet Monroe and Poetry, A Magazine of Verse. Knoxville: University of Tennessee Press, 1995. Monroe, Harriet. A Poet’s Life: Seventy Years in a Changing World. New York: MacMillan, 1938. ——–. Introduction. New Poetry. Eds. Michael Hoffman & Patrick Murphy. New York: G.K. Hall, 1992. Newcomb, John Timberman: “Others, Poetry, and Wallace Stevens: Little Magazines as Agents of Reputation,” Essays in Literature, 16.2 (Fall 1989): 256-270. Parisi, Joseph, Stephen Young. Dear Editor: A History of Poetry in Letters: The First Fifty Years, 1912-1962. New York: Norton, 2002. ———. “An American Institution:” Poetry Founded in 1912 by Harriet Monroe. Chicago, Modern Poetry Association. 1980. Poetry: A Magazine of Verse. 1912 – 1928. New York: AMS Reprints. Sherbo, Arthur. “Harriet Monroe’s Chicago Letters” Diss. 1982. William, Ellen. Harriet Monroe and the Poetry Renaissance: The First Ten Years of Poetry. Urbana, IL: University of Illinois Press, 1977.